The Witnessing Experience on March 12 was one to remember. It was the first one we had the devil really fight and try to make us discouraged by sending gushing rain for the first hour in Richmond. The Lord though seemed to give us an urge though to still press on and find those lost souls. I personally found that being at the front of the sky train entrance was good because there was always a good flow of people coming through. I had several good witnesses with young people and tried to make them really think about where they were going when they died. One young man’s eyes nearly popped out when I said that if you believe what is in this book you can have Eternal Life. 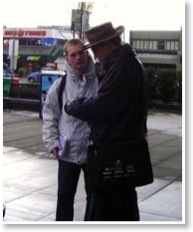 Another young man walked around where we were for nearly 20 minutes just reading pages of the Rapture Message. Praise God!! The Message is getting out!! I have already heard of calls of people with questions and searching for the truth so to God be the Glory and if it’s for one…it’s worth it ALL!! !